There are very few stations in South America with long-term data. 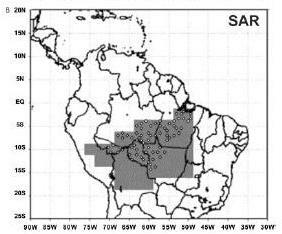 The following figure shows satellite temperature data trend from the RSS analysis 1979 - 2008 for South America [http://www.ssmi.com/msu/msu_data_description.html]. The following figures show average temperature anomalies for 1900 – 2006 (from the GHCN database) and then superimposed on the IPCC model plots (from AR4 Fig 9.12) for Amazon and Southern South America (pink= models with CO2, blue= models without CO2, black= observed). The third pair is similar but for all of South America (with IPCC plot from AR4 Fig SPM-4) . 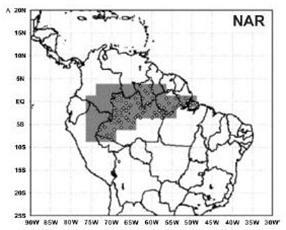 The following figures show average temperature anomalies for 1900 – 2009 (from the HadCRU CRUTEM3 database plotted at http://www.appinsys.com/GlobalWarming/climate.aspx) for four regions within South America. Rural: There are no long-term rural stations in northern South America. For further examples of urban versus rural comparisons in South America see: http://www.metsul.com/secoes/visualiza.php?cod_subsecao=33&cod_texto=557 (in Portuguese). Steve McIntyre of ClimateAudit.org plotted the monthly temperature data for a couple of stations in Bolivia. The NASA / GISS and NOAA / GHCN monthly data sets end in the 1980s for many stations, but the daily databases actually continue closer to the present. 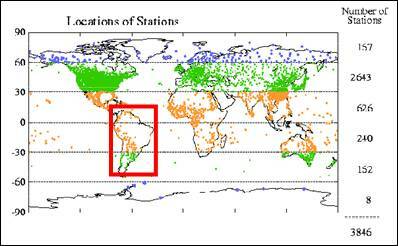 The following two figures show stations in Bolivia where the GHCN monthly data is no longer calculated after 1987. The black lines show monthly data from the NASA GISS data, the red lines show monthly data calculated from the daily data by Steve McIntyre, and the blue line shows the NASA GISS annual temperature data. 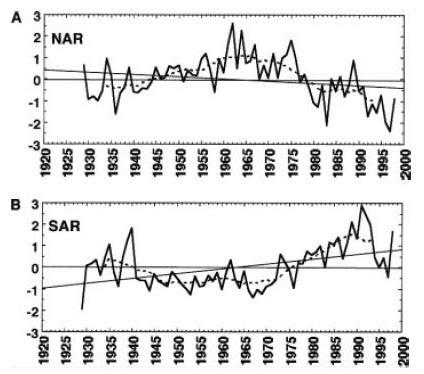 In both cases the warming that started to appear in the 1980s disappeared in the more recent data. 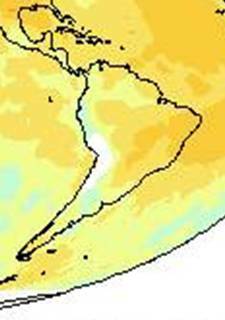 The following figures show sea level trends for three locations in South America (from the NOAA database [http://tidesandcurrents.noaa.gov/sltrends/index.shtml]) Sea level is decreasing on the west and south areas, and increasing on the east and north sides.